Los Angeles and Nagoya Sister City Affiliation was born as a part of President Eisenhower’s Citizens’ international Exchange Program in 1959, creating a sister city relationship between the cities of Los Angeles and Nagoya. The primary goal of the sister city program is to foster mutual understanding between the people of Los Angeles and Nagoya through people-to-people exchange activities. The cities of Los Angeles and Nagoya became sister cities in 1959 the first such relationship for each city under the stimulus of President Eisenhower’s People to People Program. Robert Wilkinson with the Port of Los Angeles became the first Chairman of this committee. One of the first tests of the sister city relationship came in late 1959 when the Nagoya area was devastated by the Ise Bay Typhoon. Los Angeles sister city members organized and shipped to Japan relief supplies for the citizens of Nagoya. The City of Nagoya responded in kind during the Northridge Earthquake in 1994. The committee undertook a number of exchange activities with the City of Nagoya, including a student exchange, but existed without formal structure until March 21, 1963 when the Los Angeles – Nagoya Sister City Committee was formally established. Then, in 1965 the Los Angeles Nagoya Sister City Affiliation (or “LANSCA” as it is usually called) was established as a non profit organization staffed by volunteers to assist the City of Los Angeles and the Mayor of Los Angeles in the many activities and functions which surround its sister city relationship with Nagoya, Japan. LANSCA comes within the umbrella of Sister Cities of Los Angeles, Inc., (click to web page) also a nonprofit corporation that oversees all of the sister cities of Los Angeles, and participates in the activities of Sister Cities International (click to webpage), an organization formed to help sister city programs throughout the United States. Councilman Tom LaBonge of the 4th District is the current president of SCLA and has been an enthusiastic supporter of LANSCA’s activities. LANSCA does not receive any funding from the City of Los Angeles for its activities but instead relies upon donations and fund raising efforts. Over the 55 years of the sister city relationship, there have been numerous exchanges of official city flowers, zoo animals, children’s art, library materials, museum exhibitions, baseball and soccer teams, marathon runners, and so forth. In celebration of the 30th anniversary of the establishment of the Sister City Affiliation, LANSCA arranged a beautifully catalogued exhibition in Nagoya of contemporary artists from Los Angeles and received an exhibition of contemporary art from Nagoya the next year (Art Exchange) (click to web page). Civic exchanges are a regular activity of LANSCA. Every year, the City of Nagoya sends a Goodwill Delegation consisting of city officials from the Office of the Mayor and Nagoya City Assembly and ordinary citizens to Los Angeles to participate in LANSCA events and the Nisei Week Parade in Little Tokyo. From time to time, the Mayor of Nagoya visits the Mayor of Los Angeles, and LANSCA assists with the arrangements. Every fall Nagoya stages a magnificent Nagoya Festival, a multi-day affair attended by hundreds of thousands. A delegation from LANSCA usually attends and represents the City of Los Angeles in the Festival activities, including the open car parade. Another major activity of Sister City relationship is the presentation of gifts by each city to the other. For example, the City of Nagoya has given to the City of Los Angeles via the Sister City Affiliation a beautiful Golden “Mikoshi” Portable Shrine and “Karakuri Ningyo” Dancing Puppets Float, both of which are prominently displayed at the entrance to the Mayor’s Office on the third floor of City Hall, an authentic tea house from Nagoya located in Wattles Park, a solar powered 26 foot high stainless steel clock tower located at the corner of First and Main Streets across from City Hall, and a white ceramic reproduction of the Golden Dolphin from Nagoya Castle located in the International Section of the Los Angeles Central Library. Furthermore, there is a Nagoya Street in Los Angeles, near the Convention Center, and also a Nagoya Street near Ports O Call Village in San Pedro. On the Los Angeles side there is a “Los Angeles Square” in Nagoya’s Central Park where some of the gifts given by Los Angeles to Nagoya are situated, including an Alabama Rock from the Eastern Sierra, a “Friendship Wall” sculpture by local artist Dora De Larios, five reproductions in bronze of the hand and foot prints of famous movie stars from the forecourt of the Mann’s Chinese Theatre in Hollywood together with an eagle sculpture entitled “Spirit of Freedom” by local artist Brett Livingston-Strong, and a reproduction of 25 squares from the Hollywood Walk of Fame (presented jointly with the Port of Los Angeles). In the entry to the Nagoya International Center hangs a mural-sized painting of Los Angeles landmarks by artists with the Hollywood Beautification Team. 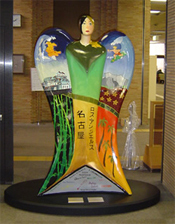 In 2004, LANSCA gave a full-sized Angel statute named “Angel de Los Angeles y Nagoya” painted by students from the Ragan Art Academy, Barnsdall Arts/Friends of the Junior Arts Center which is now located in Tsuruma Central Library in Nagoya. The gift commemorated the 45th anniversary of the sister city relationship. In 2009, a quilt crafted by children of the Ragan Art Academy was given to the City of Nagoya in commemoration of the 50th anniversary. LANSCA commemorated the 2012 Japan-U.S. Cherry Blossom Centennial by arranging for cherry trees to be planted in several locations in Los Angeles. The trees, provided by the Huntington Botanical Gardens, are planted in Griffith Park, the Los Angeles Convention Center, and Roosevelt High School. Membership in LANSCA is open to all who are interested in meeting citizens from Los Angeles’ sister in Japan. The Cities of Los Angeles and Nagoya share several sister relationships. 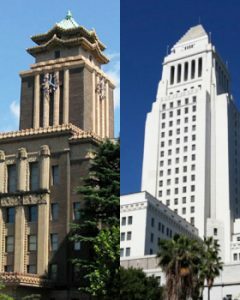 Los Angeles and Nagoya share civic and non-profit relationships.